I missed posting about this album when it came out last Tuesday and it's worth mentioning because it's the best hip-hop album of the year so far. Outkast are arguably my favorite hip-hop group of all time (De La Soul & Public Enemy would be in the discussion as well) so anything Big Boi or Andre put out I'm going to check out. This album has been in the making for what seems like two or three years. 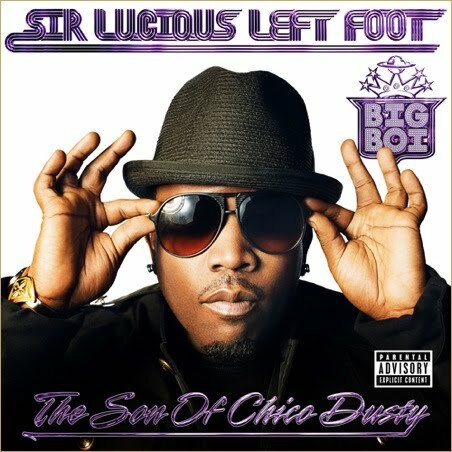 I'm not sure it would actually see the light of day but Big Boi finally released his second solo album, Sir Lucious Left Foot: The Son Of Chico Dusty. I previously posted videos for the first two singles 'Shutterbug' and 'General Patton' and it's no surprise that they are two of the best tracks on the album, with the latter in the running for best track on the record. A few other highlights are the sultry jam 'Tangerine' and another candidate for best track of the album 'Shine Blockas'. The latter contains a sample of one of the best R&B tunes ever in Harold Melvin and the Blue Note's 'I Miss You'. The album has only a few mis-steps. The beat for 'Follow Us' is one of the best on the album, unfortunately the vocalist that sings the hook completely ruins the song for me. The other weakest track on the album, 'You Ain't No DJ', is the one song that Big Boi's Outkast partner Andre 3000 produced. Despite those two blemishes, no hip-hop album can touch this record so far in 2010. Big Boi is playing a show at The Jones downtown on Friday.